We supply user guides and instruction manuals for all makes and models of mobile phones or cell phones, in most languages. Supplied as booklets with black text (unless otherwise specified) and full 4 colour printed jacket. They are either stapled or perfect bound. User guides are produced to order and usualy take 3-5 days to manufacture. 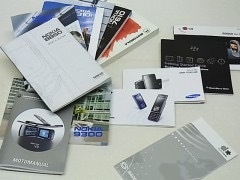 The manuals are printed with the mobile phone manufacturer's name and mobile phone model number. Minimum order quantity: 100 booklets. For large orders over 1000 pieces, we can supply mobile phone manuals for as little as 35p. We can also supply mobile phone software on disc. STEP 1: Please complete the boxes below to add a user guide to the list of guides that you wish to buy. Then click "Add Guide". Repeat this process until you have completed your list. Then move to Step 2 below. STEP 2: When you have completed the list of user guides that you wish to buy in Step 1 above, then please click "Add to Cart" below.